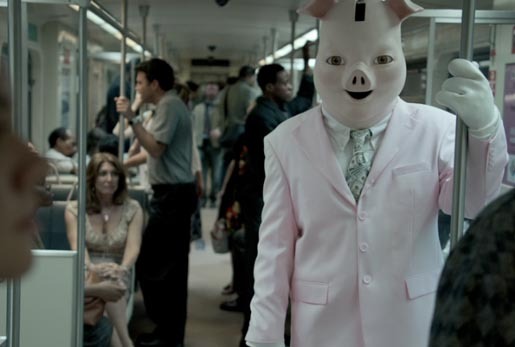 The American Institute of Certified Public Accountants (AICPA) and the Ad Council have launched “Chase”, a new television commercial as part of their national multimedia public service advertising campaign for Financial Literacy, Feed the Pig. The Feed the Pig campaign encourages 25 to 34 year olds take control of their finances and add saving to their daily lives. Educating the youth market in this post-Great Recession era about the pros of saving money, the humorous new commercial features an epic chase scene between a man and Benjamin Bankes, the campaign’s iconic ”spokespig.” The campaign features TV, radio and print ads, online at www.feedthepig.org. The Feed The Pig campaign was developed at Turbine, Southport, CT, by creative directors Rob Slosberg and Jeff Vogt, senior art director Matt Songer, producer Alice Chevalier. Filming was shot in Baltimore by director Matt Pittroff via Twist Film, New York and Minneapolis, with director of photography Andy Lilien, executive producers Jim Geib and Amyliz Pera, and line producer Steve Blair. Post production was done at ShootersNYC, by editor Anthony Marinelli, with smoke/Flame artist Mark Farkas, and executive producer Jeff Beckerman. Colorist was Tim Masick at Company 3. Sound was designed at ShootersNYC and Pirate New York by editor Anthony Marinelli and sound designer Dave Rivera. Music was composed by Filip Mitrovic at Pirate NY. Audio post production was done at Plush, New York, by mixer James Twomey.